Chart based on 24 repairs. 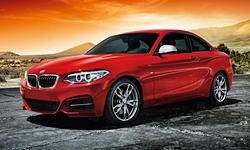 See TSBs and recalls for the 2015 BMW 2-Series. Chart based on 15 repair trips. The repair cost chart excludes repairs made under warranty, do-it-yourself repairs, and repair trips that include maintenance. Jan 2017 Bent suspension component base and screws. Would vibrate front suspension at certain speeds. Covered under warranty. US $110 Front passenger side wheel center cap was missing. They refused to fix it under warranty even though the wheels have never been off the car (so could not have been caused by previous work on the car). 5000 mi iDrive would reboot from time-to-time on trip starts. They replaced the idrive unit finally and the problem is gone. 21000 mi Exhaust rattle at precise low temperatures. The exhaust flap/valve (that's used to make it quieter/louder) was replaced. and interior trim not flush (carbon fiber). took a few days to get the carbon fiber trim in. 1500 mi Wind noise from driver side. Seal was reseated and noise is gone. 11000 mi Clacking noises from the driveline, dealer claims it's normal. 13000 mi Wheel sensor went bad, many dash lights lit up and I was warned to 'drive moderately and see a dealer'. 17000 mi Electric cooling fan in front of the radiator stopped working. Replaced and car is fine now. 44000 mi Rear light cluster failed. Ground wire short. Known issue with Service Bulletin. Rattle from convertible top mechanism. Dealer replaced some little plastic bits. 21500 mi Electrical: Alarm went off while driving (wtf? ), no code sent off, so no fix. Changed engine oil. Brakes, tires are low. Lots and lots of rattling. Dealer did nothing. Transmission rough 1st to 2nd - only happens on very first shift on start up (warm or cold). No code, no fix Top wear / creaks when going over bumps. No fix, probably needs replacement soon due to regular use. Jul 2015 Motion sensor for the alarm system was defective and had to be replaced. See our lemon odds and nada odds page to see vehicles with no repairs or vehicles with more than three repairs. To see how frequently 2015 BMW 2-Series problems occur, check out our car reliability stats.